If this card is Tributed by a card effect: You can add 1 Dragon-Type "Nekroz" Ritual Monster from your Deck to your hand. If this card is banished: You can target 1 of your banished "Nekroz" monsters, except this card; Special Summon it. You can only use 1 "Exa, Warrior of the Nekroz" effect per turn, and only once that turn. It can only add two targets, and only one of them is usable. Run 0. If this card is Tributed by a card effect: You can add 1 Spellcaster-Type "Nekroz" Ritual Monster from your Deck to your hand. If this card is banished: You can send 1 "Nekroz" monster from your Deck to the Graveyard, except "Archmage of the Nekroz". You can only use 1 "Archmage of the Nekroz" effect per turn, and only once that turn. Due to there being much better Spellcaster rituals, this card has many targets that you actually want to search. It's banish effect is nice as well, since it has synergy with Exomirror and Cycle. Run 1. Your opponent cannot activate cards or effects in response to the activation of "Nekroz" Ritual Spell Cards, also "Nekroz" Ritual Monsters you control cannot be targeted by your opponent's card effects. If this card is Tributed by a card effect: You can target 1 of your banished "Nekroz" monsters, except "Dance Princess of the Nekroz"; add that target to your hand. You can only use this effect of "Dance Princess of the Nekroz" once per turn. An interesting card. Protecting your Ritual summons is decent, but not great. Her tribute effect can recycle some good stuff late game, but is useless early game. Run 0-1. If you Ritual Summon exactly 1 "Nekroz" Ritual Monster, this card can be used as the entire Tribute. If this card is Tributed by a card effect: You can add 1 Warrior-Type "Nekroz" Ritual Monster from your Deck to your hand. You can only use this effect of "Schritt, Caster of the Nekroz" once per turn. This guy lets us summon our Big monsters without jumping through hoops, and his tribute effect can basically add anything you want. Run 2-3. You can Ritual Summon this card with any "Nekroz" Ritual Spell Card. Must be Ritual Summoned by using monsters other than Level 10 monsters, and cannot be Special Summoned by other ways. During either player's turn: You can discard this card, then target 1 "Nekroz" monster you control; it gains 1000 ATK and DEF until the end of this turn. You can target 1 Set card your opponent controls; destroy it, and if you do, banish it. You can only use each effect of "The Nekroz of Decisive Armor" once per turn. While it's effects are somewhat underwhelming, it comes in handy more often than you might think. Run 1. You can Ritual Summon this card with any "Nekroz" Ritual Spell Card. Must be Ritual Summoned by using monsters other than Level 9 monsters, and cannot be Special Summoned by other ways. During either player's turn, when a "Nekroz" monster(s) you control is targeted by a card or effect: You can discard this card; negate the activation. When this card is Ritual Summoned: You can banish 1 card from your opponent's side of the field, hand (at random) and Graveyard. You can only use each effect of "The Nekroz of Trishula" once per turn. You can't go wrong with a copy of Trishula. However, summoning him at the wrong time could cost you game, and he clogs as well. Also note that he can't activate his effect if your opponent's hand, field or graveyard is empty. Run 1. You can Ritual Summon this card with any "Nekroz" Ritual Spell Card. Must be Ritual Summoned by using monsters other than Level 8 monsters, and cannot be Special Summoned by other ways. When an opponent's monster declares an attack: You can banish 1 "Nekroz" card from your Graveyard, then discard this card; negate that attack, then end the Battle Phase. You can Tribute 1 or 2 monsters from your hand and/or your side of the field, and if you do, draw 1 card for each card Tributed. You can only use each effect of "The Nekroz of Valkyrus" once per turn. Just look at Yung Valk. Both his field and discard effect is amazing. He can empty your field to get a mirror search, not to mention an empty field means you can't get Trish'ed in the mirror. You also have a Swift Scarecrow on Steroids. This guy put this deck into a different direction. It did take a while for many to realize how amazing this card is, but of course I realized it's potential much earlier than the peasants. Run 2-3. You can Ritual Summon this card with any "Nekroz" Ritual Spell Card. Must be Ritual Summoned by using monsters other than Level 7 monsters, and cannot be Special Summoned by other ways. During either player's turn: You can discard this card, then target 1 "Nekroz" monster you control; this turn, it cannot be destroyed by battle or card effects. During either player's turn: You can discard 1 "Nekroz" card, then target 1 card on the field; destroy it. You can only use each effect of "The Nekroz of Gungnir" once per turn. The discard effect is costly, but it protects your monster for the entire turn. The level makes her somewhat difficult to summon, but she shines in the Qli matchup. Run 1. You can Ritual Summon this card with any "Nekroz" Ritual Spell Card. Must be Ritual Summoned by using monsters other than "The Nekroz of Brionac", and cannot be Special Summoned by other ways. You can discard this card; add 1 "Nekroz" monster from your Deck to your hand, except "The Nekroz of Brionac". You can target 1 or 2 monsters on the field that were Special Summoned from the Extra Deck; shuffle them into the Deck. You can only use each effect of "The Nekroz of Brionac" once per turn. He searches the entire archetype and also has a potentially devastating on-field effect? Hell yeah. Remember to use the search wisely, and don't pointlessly search for the sake of deck thinning. Run 3. Always. You can Ritual Summon this card with any "Nekroz" Ritual Spell Card. Must be Ritual Summoned by using monsters other than "The Nekroz of Catastor", and cannot be Special Summoned by other ways. You can discard this card, then target 1 "Nekroz" monster in your Graveyard; Special Summon that target. You can only use this effect of "The Nekroz of Catastor" once per turn. At the start of the Damage Step, if a "Nekroz" monster you control battles a monster that was Special Summoned from the Extra Deck: Destroy that monster. He sounds useful, until you realize that he can only summon our fodder that we usually banish anyway. 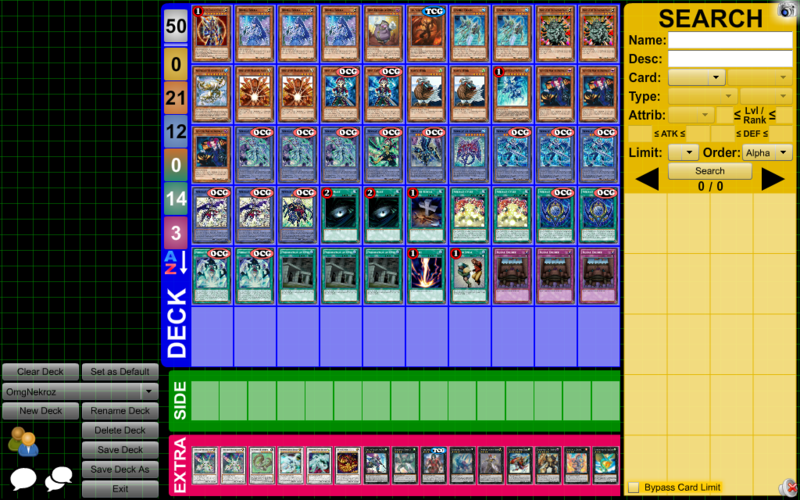 Brio, Claus, and Unicore also does the whole "anti-extra deck" thing better. You can Ritual Summon this card with any "Nekroz" Ritual Spell Card. Must be Ritual Summoned, and cannot be Special Summoned by other ways. You can discard this card, then target 1 "Nekroz" card in your Graveyard, except "The Nekroz of Unicore"; add it to your hand. You can only use this effect of "The Nekroz of Unicore" once per turn. Negate the effects of all face-up monsters on the field that were Special Summoned from the Extra Deck. He has a useful on-field effect, he can reuse anything in your graveyard, and he also combos extremely well with Arc Light and Kaleidomirror. Run 3. You can Ritual Summon this card with any "Nekroz" Ritual Spell Card. Must be Ritual Summoned, and cannot be Special Summoned by other ways. You can discard this card; add 1 "Nekroz" Spell/Trap Card from your Deck to your hand. During either player's turn: You can target 1 monster on the field that was Special Summoned from the Extra Deck; its ATK becomes 0, and if it does, its effects are negated. These changes last until the end of this turn. You can only use each effect of "The Nekroz of Clausolas" once per turn. Pendulum Effect: You cannot Pendulum Summon monsters, except "Nekroz" or "Sephira" monsters. This effect cannot be negated. Monster Effect: If a "Nekroz" or "Sephira" card(s) in your Monster Zone or Pendulum Zone is destroyed by battle or card effect, except "Sephira Exa the Flame Beast Nekroz", while this card is in your hand or Graveyard: You can Special Summon this card. You can only use this effect of "Sephira Exa the Flame Beast Nekroz" once per turn. Monster Effect: You can Tribute this card from your hand or face-up from your side of the field; Tribute monsters from your hand or field, then Ritual Summon 1 "Nekroz" Ritual Monster from your hand whose Level equal the total Levels of those monsters. You can only use this effect of "Sword Saint of the Nekroz - Sephira Saber" once per turn. Not as bad. But we still don't need it. When this card is Normal or Flip Summoned: You can add 1 Ritual Monster Card or 1 Ritual Spell Card from your Deck to your hand. 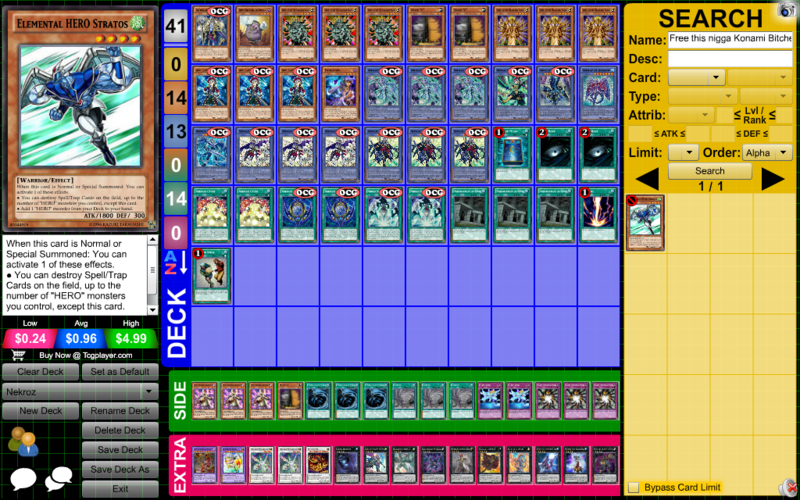 This guy searches our entire deck, and also lets us go for Xyz plays with Unicore. Run 3. When this card is Normal or Flip Summoned: You can add 1 Ritual Monster Card from your Deck to your hand. With Claus, he practically does the same thing. Run 3. When you Ritual Summon a Ritual Monster, you can remove from play this card from your Graveyard as 1 of the monsters required for the Ritual Summon. While the monster Ritual Summoned using this card is face-up on the field, your opponent cannot Special Summon. This card stops your opponent from playing. He also turns an otherwise skilled mirror match into a draw-an-out-or-die game. Run 1 between the main and side deck. Any monster sent from the hand or Main Deck to the Graveyard is banished instead. When a Spell/Trap Card or monster effect is activated: You can Tribute this card; negate the activation, and if you do, destroy it. If this card is sent to the Graveyard: You can add 1 Ritual Monster or 1 Ritual Spell Card from your Deck to your hand. Dump this with Kaleidomirror to summon Unicore and get another search. Run 2. Add to your hand 1 Level 7 or lower Ritual Monster Card from your Deck. Then you can add to your hand 1 Ritual Spell Card from your Graveyard. An instant search card that allows us to search the entire deck and potentially +1 ? Yes. Run 3. Add 1 Level 4 or lower Warrior-Type monster from your Deck to your hand. Allows us to search Claus and Schritt. Kind of redundant. Change all face-up monsters on the field to face-down Defense Position. During the End Phase, flip all face-down Defense Position monsters your opponent controls face-up, and if you do, your opponent draws 1 card for each. An easy out to monster floodgates. We can also use it to set a Ju and Flip Summon it next turn. If you destroy the monsters before they get flipped up, your oppoent doesn't get the draw(s). Cannot be Special Summoned. During the End Phase of the turn this card is Normal Summoned or flipped face-up: Return it to the hand. When this card is Normal Summoned or flipped face-up: Target 1 face-up monster on the field; change that target to face-down Defense Position. Another easy out. It goes back to your hand, so you can re-use whenever it need be. Don't forget, the effect is mandatory, so it will flip itself if there is no other monsters on the field. Target 1 Spell/Trap Card on the field; destroy that target. Believe it or not, this card is not popular in the main in many OCG decks, and for good reason. Only time will tell if this holds true for the TCG. But for now, it is up to you. You've probably heard of the Shooting Star combo before, but overall, it's really underwhelming. You're taking 3 valuable cards out the hand, just for a measly 5900 damage. It's not worth the space. At all. Cannot be Special Summoned. If you control no Set Spell/Trap Cards, neither player can Set Spell/Trap Cards nor activate any Set Spell/Trap Cards on the field. Honestly, this probably belongs in the tech section. But this is a card you shouldn't be maindecking. It's horrible in the mirror, and nine times out of ten you're better off summoning a Ju. If this card is in your hand or Graveyard: You can banish a total of 2 WATER and/or Dragon-Type monsters from your hand and/or Graveyard, except this card; Special Summon this card. During your opponent's End Phase, if this card was Special Summoned: Return it to the hand. You can discard this card and 1 WATER monster to the Graveyard; send 1 monster from your Deck to the Graveyard. If this card is banished: You can add 1 WATER Dragon-Type monster from your Deck to your hand. You can only use 1 "Tidal, Dragon Ruler of Waterfalls" effect per turn, and only once that turn. The Foolish effect is better used by Lavalval Chain, and whatever you're discarding is probably more valuable in the hand. You needs monsters in the grave for the spells and Unicore. It's not worth the mediocre beatstick. OP is inaccurate; Valk is awful. Run 0. Needs moar Exa-Beetle. #hashtag wrote: Pew, pew, pew! Shhh. I'm weakening the scrubs so I can rek them with beetle later.